This is my go to Banana Muffin that I have used for years. I always add a bit of vinegar in with the milk to help them rise a little higher as bananas tend to weigh muffins down. 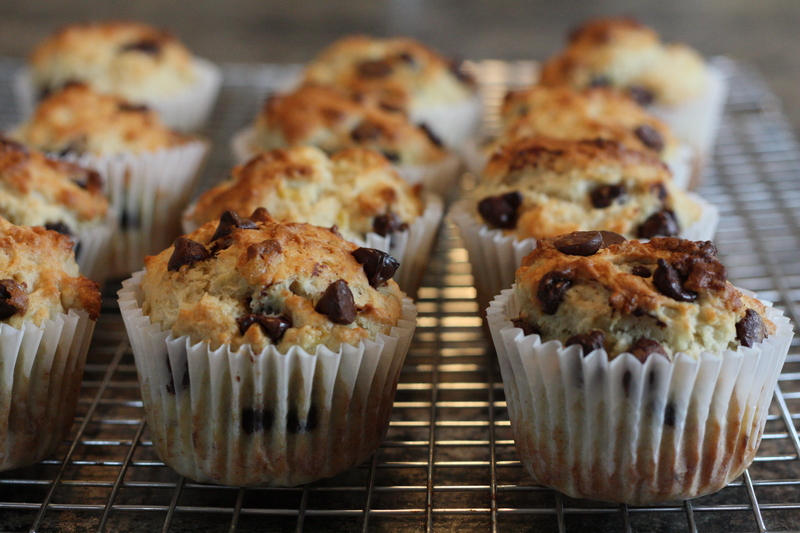 The kids will eat pretty much anything if there’s chocolate chips involved so these muffins are always a hit! Combine the wet and dry ingredients until just incorporated. Fill muffin tins about 2/3 full. Makes 12. Bake 400 degrees for approximately 20 minutes. Hi, I have a page called Helpful Products where I have listed some alternate products that can be used for replacing eggs. You can use ground Flax seed or Yogurt and have good results. Its generally 1/4 cup plain or Greek yogurt per egg when using yogurt and when using Flax seed its 1 tbsp ground flax seed mixed with 3 tbsp water per egg. I do not have all alternatives listed with every recipe as I only post the way I bake them so I know the recipe will be a true success depending on the amounts of the other ingredients in the recipe. Thanks for checking out my blog and I hope you have success with your eggless baking! Thanks a lot Jacquelyn for your quick and helpful response.I tried to bake with your suggestion and it came out too good.My family liked it a lot:) !! !Appreciate your efforts on this blog and thank you for delicious recipes!! Merry Christmas to you and your family and have a wonderful New Year!!! That is great! Merry Christmas to you too!